If you wanted a career as an electronics technician at the end of World War II, the world was your oyster - so to speak. Electronics and communications trade magazines and publications like Mechanix Illustrated and Popular Science ran a plethora of ads monthly that offered unlimited opportunity to men seeking a career servicing the burgeoning market of postwar technological marvels. 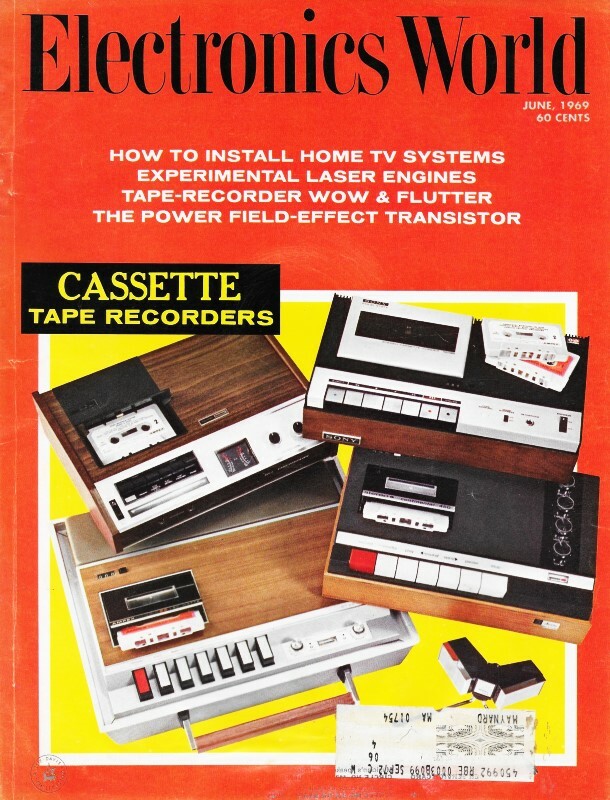 Even though the enclosures were not yet being marked with "No user serviceable parts inside," that fact was most people were not qualified - nor did they want - to monkey with the guts of radios, televisions, and other household appliances provided ample favorable circumstance to the ambitious wannabe technician. Of course the field extended well beyond domestic products to military and commercial venues. Regardless of a person's interests, financial security, prestige, and a lifetime of satisfaction were a sure thing after successful completion of one of these training courses - whether in a classroom or at home with a mail order plan. Believe it or not, there is still plenty of opportunity today for electronics technicians who want to service household appliances if they are willing to do business via Internet clientele; YouTube is full of guys hacking their services for repairing vintage equipment as well as modern equipment like cellphones and out-of-warranty audio/visual gear. BTW, the answer given for Q2 is more correctly 21.4 Vpk-pk since when the reverse biased Zener is conducting at 10, the forward biased Zener would be at around 0.7 V, so the total would be 2 * (10 + 0.7) V = 21.4 Vpk-pk. Yes? No? Can you solve these two basic problems in electronics? When Switch S2 is closed, which lamp bulbs light up? Note: If you had completed only the first lesson of any of the RCA Institutes Home Study programs, you could have solved this problem. What is the output voltage (p-p)? Note: If you had completed the first lesson in the new courses in Solid State Electronics, you could have easily solved this problem. These new courses include the latest findings and techniques in this field. Information you must have if you are to service today's expanding multitude of solid state instruments and devices used in Television, Digital, and Communications Equipment. If you had completed an entire RCA Institutes Home Study Course in Semiconductor Electronics, Digital Electronics, or Solid State Electronics, you should now be qualified for a good paying position in the field you choose. Send for complete information. Take that first essential step now by mailing the attached card. Are you just a beginner with an interest in electronics? Or, are you already making a living in electronics, and want to brush-up or expand your knowledge? 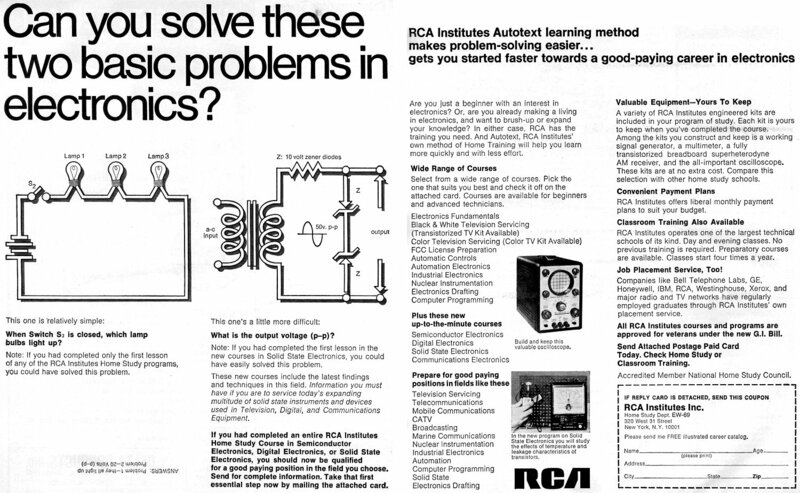 In either case, RCA has the training you need. And Autotext, RCA Institutes' own method of Home Training will help you learn more quickly and with less effort. Select from a wide range of courses. Pick the one that suits you best and check it off on the attached card. Courses are available for beginners and advanced technicians. Build and keep this valuable oscilloscope. In the new program on Solid State Electronics you will study the effects of temperature and leakage characteristics of transistors. A variety of RCA Institutes engineered kits are included in your program of study. Each kit is yours to keep when you've completed the course. Among the kits you construct and keep is a working signal generator, a multi meter, a fully transistorized breadboard superheterodyne AM receiver, and the all-important oscilloscope. These kits are at no extra cost. Compare this selection with other home study schools. RCA Institutes offers liberal monthly payment plans to suit your budget. RCA Institutes operates one of the largest technical schools of its kind. Day and evening classes. No previous training is required. Preparatory courses are available. Classes start four times a year. Companies like Bell Telephone Labs, GE, Honeywell, IBM, RCA, Westinghouse, Xerox, and major radio and TV networks have regularly employed graduates through RCA Institutes' own placement service. All RCA Institutes courses and programs are approved for veterans under the new G.I. Bill. Today. Check Home Study or Classroom Training. Accredited Member National Home Study Council. Please send me FREE illustrated career catalog. 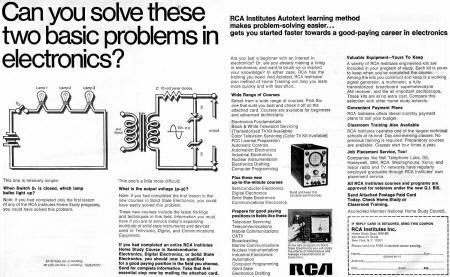 Get all the facts on the easy RCA Autotext way of learning electronics at home. Send for free full color 64-page career catalog. Accredited Member of National Home Study Council. Please rush me free illustrated Career Catalog and information on courses checked below. Canadians: These courses available in Canada. No postage. No customs. No delay. Inquiries will be referred to our school in Canada. Take advantage of this opportunity to train with a leader - RCA Institutes. home Training or Classroom Training.